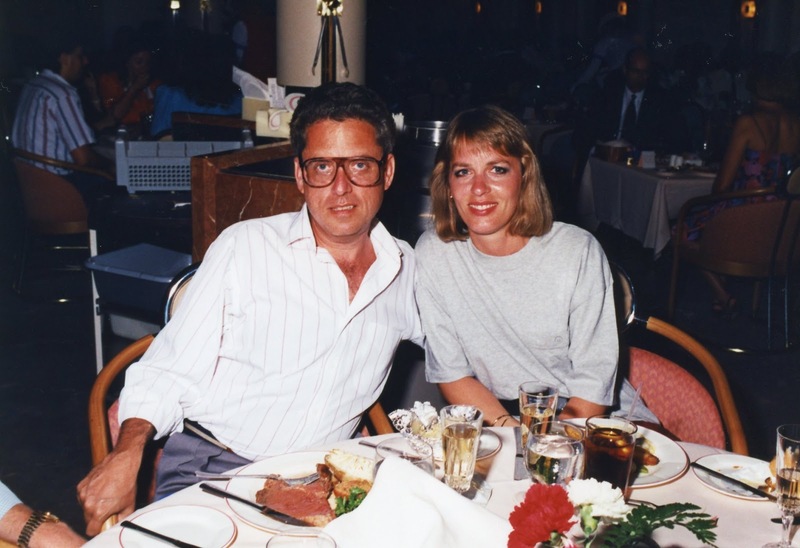 During the summer of 1990, Barbara and I had been dating for about 18 months and had already taken one vacation together. 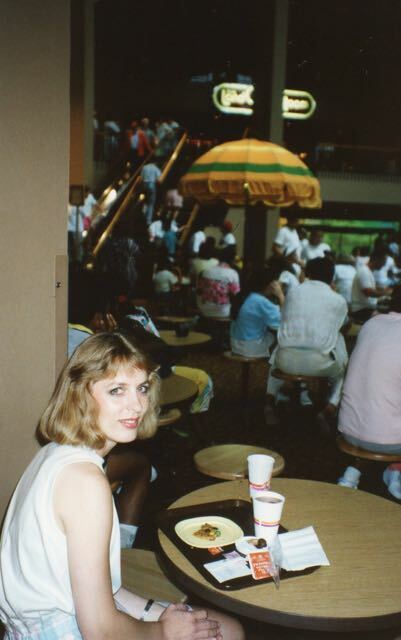 That year we decided to go on our first cruise preceded by a visit to Disney World. This is the story of that trip. We arrived in Orlando around noon, and by 2:30 were checked into our room at Disney's Caribbean Beach, a new, inexpensive (for Disney) lodging. The room was slightly better than one would expect at a newish Red Roof Inn, and the setting was much nicer. It cost about twice as much. 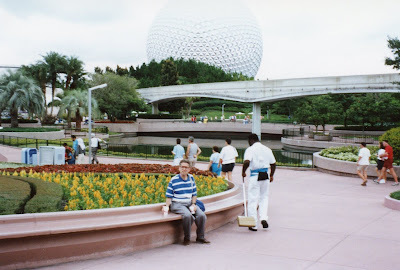 Besides the nicer setting, having rooms on Disney property allowed us to make dinner reservations at EPCOT and MGM in advance. It also allowed us to park for free anyplace in Disney World. We reached EPCOT at 3:00 and much to our amazement found very little in the way of lines. 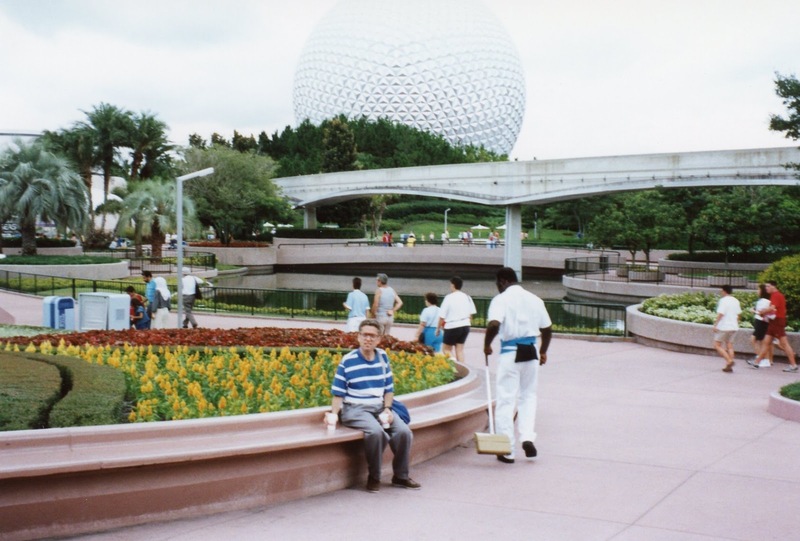 For instance, we waited a grand total of 5 minutes to get into Spaceship Earth, about 20 minutes to see Captain EO, and not at all to see the World of Motion. The longest we waited was an hour for Body Wars. After making it to the front of the line, I heeded the motion sickness warnings and elected not to ride. Instead the attendant let me watch Barbara ride on a little tv monitor they have at the control panel. It was fascinating to watch people react to what was happening on the screen (and what the simulator was making them think was happening to their bodies!) We had dinner at the Mexican exhibit (a fine meal I might add), and spent a little more time walking around other exhibits before heading back to the room and to bed. Sunday morning, bright and early, found us waiting to be admitted to the Magic Kingdom. By getting there early we accomplished two important things: 1) we managed to get lunchtime reservations at the Diamond Horseshoe Jamboree, and 2) we managed to ride a couple of the more crowded rides without waiting in long lines. We pretty much saw everything we wanted to without terribly long lines except for the Jungle Cruise (where the wait seemed interminable). By about 3pm, the heat and lines had gotten to us and we decided to more or less forget Tomorrowland, and did a little shopping on Main Street. We were back in the car by 4:30pm and in MGM by 5pm. Our intention was to walk around MGM to say we had been there. We had heard that the lines were incredibly long and were not at all interested in standing around waiting. We were pleasantly surprised to discover that there were hardly any lines at all. We waited at most 15 minutes for one of the rides, and much less for the others. We especially enjoyed Star Tour which apparently is similar to Body Wars at EPCOT, only better. This one I rode (Barbara talked me into it) and I was quite impressed. With this technology, I'm sure that the Disney folks could put together an "impossible" rollercoaster without having to actually build one. For the Monster Sound Effects show, I was picked to do some of the sounds. After doing the backstage tour, it was time for our reservation at the Brown Derby, where we had an excellent meal, before going back to our room. Instead of going right to bed, we walked around the lagoon a while. A very pleasant evening. Monday, bright and early, we checked out and drove to Fort Lauderdale airport. There we were met by representatives of the Royal Caribbean Cruise Lines who arranged transportation for us to the M/S Nordic Empress at the Port of Miami. (The Nordic Empress eventually was retired from the RCCL fleet but is still sailing as the Empress as part of Pullmantur Cruises, a subsidiary.) We reached the ship about 2pm, and immediately boarded. As approached from land, the ship looks more like a smallish Hyatt Regency than a ship. Once on board, we were greeted by a hostess and a string quartet, and marveled at the multi-story lobby atrium complete with glass elevators...again, just like the Hyatt Regency. Our room was on floor 9 out of 10 (they really referred to them as floors, not decks) and was quite spacious. The room was equipped with a closet, bathroom with shower, two twin beds (which were made into a double), two nightstands, a sitting area with a sofa, a chair, and a table. The was a closet with a chest of drawers, and some shelf space. Also, outside the glass door, a balcony with two chairs and a table. Waiting for us in the room was a iced bottle of Champagne, sent to us by our travel agent. Shortly thereafter, another bottle of champagne arrived, this sent by my parents. The ship was not to sail until 5pm, so we took advantage of the time to become familiar with the ship, and to have a buffet lunch in the Windjammer Room on the 10th floor. They offered hot dogs and chicken sandwiches along with salads and desserts. Quite good. At 4:45 the ship's horn sounded, for a lifeboat drill, and shortly after 5pm, the ship left port. Barb and I opened the bottle of champagne and sat on the balcony watching Miami recede. We had signed up for the second sitting for dinner, and at 8:30 found our table. We were at a table for eight, consisting of four couples. Two of the other couples had just gotten married two days before. The other couple was engaged. They were all somewhat younger than us. The dinner that night had an Italian theme, and was well presented and quite good. There were five or six choices for each course, and I suppose they would have been happy to serve more than one of the choices. Since there was ample opportunity to eat on the cruise, I can't imagine anyone being hungry enough for two entrees! After dinner, was an hour long musical revue, complete with magician and comedians. It was very well done. By the time we got out it was almost time for the midnight buffet. Since we had just finished dinner at 9:30 or 10:00, neither of us were terribly hungry, so we just walked by to see what was on it. We couldn't believe the piles of food we saw on some people's plates. Breakfast: continental served in your room, buffet served most of the morning, or sit down, served in the dining room. You could do all three if you were so inclined. Lunch: buffet served from noon until 2pm, or sit down, served in the dining room. Tea: a buffet with sandwiches, salads, ice cream sundaes, etc. Tuesday morning found us in Nassau, where Barb and I spent a few hours shopping before returning to the ship to sit by the pool. As we left the ship Barb spotted some vendors selling starfish. I tried to talk her out of buying one, but it was only $5 and she did. She named him Freddy. About 20 minutes later Barb turned to me and said (with a smile) "Freddy stinks! ", and about 5 minutes after that he found himself in a street side garbage can. The short life of "Freddy"
In the evening, after the Captain's cocktail party, and dinner, we left the ship again, to go over to Paradise Island to win some money from Merv. Having accomplished that goal, we returned to the ship just prior to its sailing. Wednesday morning found us at an island owned by RCCL with lots of beaches. 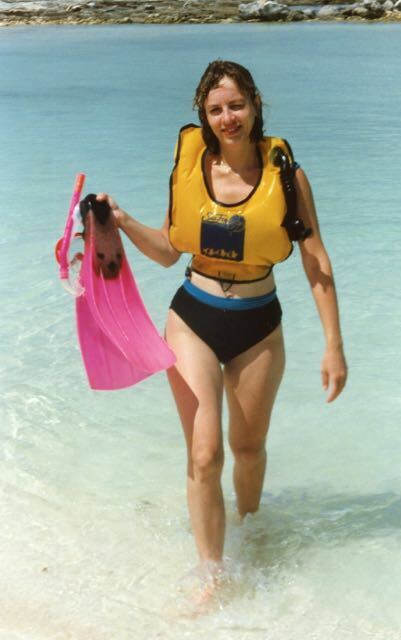 We had a great time snorkeling, and otherwise enjoying the beach. Late afternoon as the ship sailed, I was busily giving some of Merv's money to the cruise company at their three level casino. (I eventually won it back.) That evening, after dinner, there was another show, this time a broadway based review. Again, quite good. This was also the evening of the Captain's gala midnight buffet, where the buffet was decorated with ice carvings, etc. Thursday morning found us in Freeport. We took a taxi over to a place called the International Bazaar and enjoyed looking through the shops, though a heavy rain and thunderstorm made it less fun than it might have been. We spent a few minutes in the casino at the Princess Hotel, and turned $10 into $22.50 before heading back to the ship for another afternoon of sun bathing, etc. That night, was the farewell dinner, which had an American theme (other nights had been French and Caribbean). There was also a farewell show, which was excellent. 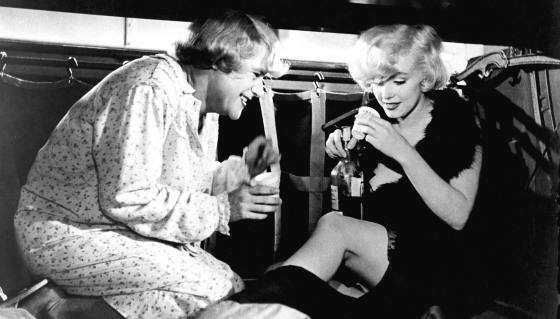 The next morning, by the time we got out of bed, the ship had already docked at Miami. We cleared immigration, went and had a final breakfast in the dining room, grabbed our carry on suitcase (the others had been picked up the night before), left the ship, found our suitcases, cleared customs, gave our suitcases to the USAir representative at pier side, and boarded a complimentary bus for the airport. A few hours later we were back in Pittsburgh, exhausted, but having thoroughly enjoyed the vacation. Would we do it again: you bet! Would we take the Nordic Empress again: yes, if we wanted a four day cruise. It appears to be the nicest of the ships in that marketplace (better, for instance, than the new Carnival ship, and much better than the old Carnival ship and the NCL Sunward II...though that ship looked very nice). I would rather take a newish, small ship, with one dinner seating, for our next cruise, mostly to avoid the crowds. But this was great, and the crowds hardly mattered most of the time. 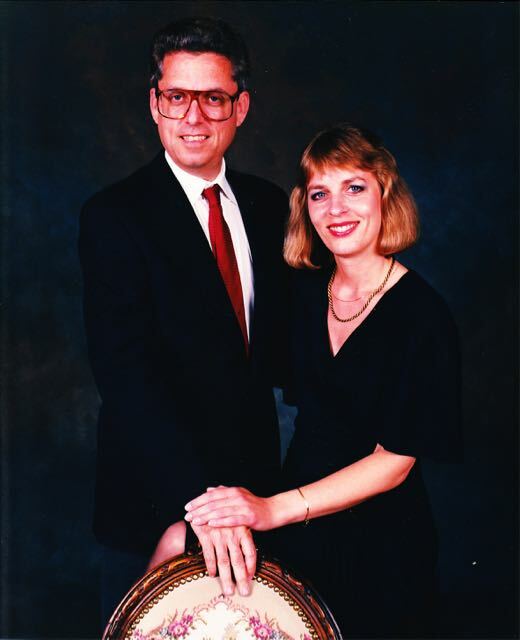 About two months later I asked Barbara to marry me, and we tied the knot the following July. We've taken several cruises since that first one (all on much bigger ships) and have visited Disney World once more (this time with Lizzy, her half-brother Chris, and his family.) After that visit I told my daughter Lizzy that if she wanted to go to anything Disney again it would be with someone else! Note: I went looking for my trip report on this August 1998 trip to Eastern Quebec and could not find it. I then recalled that I did not actually write a report since the people I would write the report for were on the trip with me. Luckily one of my traveling partners, Dave Ingles, did write a report and with his permission I have taken it and added some of my own recollections of this wonderful trip. I have kept most of the report in the present tense as it was originally written. Where the first person is used it is Dave Ingles speaking unless otherwise identified. You will notice a paucity of pictures in this article. From 1993 to about 2000 I switched from slide film to print film because I never looked at the slides. Unfortunately the photographs and negatives were packed away in a box when we moved in 2002 and I no longer know exactly where they are. My companions on the trip either did not take pictures or cannot easily get to and scan their photos. Thanks to Kalmbach Publishing Company., publisher of Trains Magazine and Classic Trains Magazine, I am able to use two photographs that Dave Ingles took while on the trip that have appeared in those magazines. 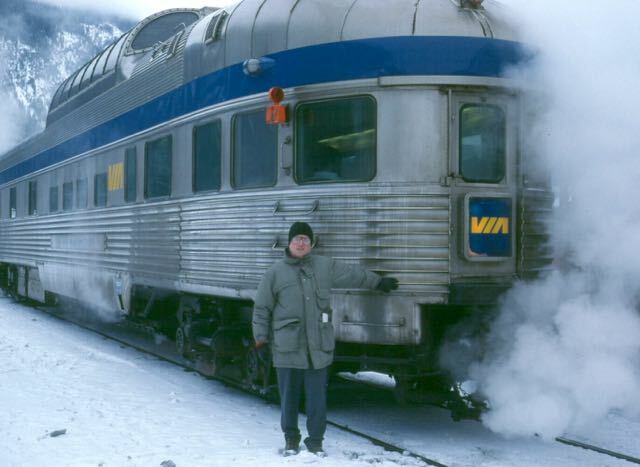 For several years, several of us railroad mileage-collectors who often travel together have talked about riding the Quebec North Shore & Labrador (QNSL) railroad. Now, thanks largely to the efforts of Rick Moser, who kept pushing the group for dates and other desires on the trip, and John Godfrey, a Montrealer who is fluent in French (well, Quebec's version of same), who acted as our Guide and Translator, we've accomplished it. The trip was enlightening, and successful enough, that John G. is giving thought to trying to organize a small tour in the North Shore ore country for other mileage collectors, especially if one or more of the freight-only carriers will bend and let a group ride. Three of us--Moser, Chuck Weinstock, and I--flew in to Montreal to gather with John G. on Saturday, Aug. 15. On Sunday, he gave us the $5 tour (i.e., complete) of the Canadian Railway Museum at Delson, where he is very active. 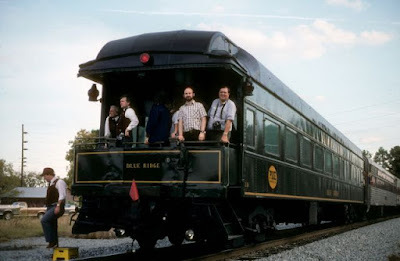 We rode both a diesel-with-coach train and a streetcar, and inspected all the engines and cars, including some that are off-limits to the public. That evening, John Arbuckle joined us at Central Station, having come in on VIA from Windsor, Ontario. Chuck, John A., and I boarded the Chaleur, whose route Chuck and I needed north of Matapedia. Rick and John G. did not need that mileage and so stayed in Montreal overnight and drove our Alamo rental minivan north the next morning. The combined Chaleur (to Gaspe) and Ocean (to Halifax) in that order out of Montreal was a whopping 23 cars behind 3 F40's. The Chaleur alone was one F40 and 10 cars: baggage, 5 sleepers, diner, Skyline dome lounge, 2 coaches. Owing to VIA's removing conductors from all trains, stops are longer than allowed in the schedule, and we were 1 hour down out of Matapedia, enabling daylight viewing of all the new trackage. We arrived at Gaspe 2 hours, 11 minutes late. This still gave time to taxi across the bridge into town, eat lunch and board our 330 pm bus to Matane. The bus took the very scenic and hilly shore highway around the peninsula north of Gaspe, continuing our circumferential ride. I'd never seen the St. Lawrence shore up there and was impressed by its ruggedness. The meal stop was at St. Anne-des-Monts (St. Anne of the mountains -- St. Anne is the patron of sailors and there's a bunch of St. Anne towns up there, plus 4011-hundred other "St." villages; for those who haven't been there, each and every village, and some of 'em are bleak, are dominated by a Catholic church); we arrived in Matane on time at 920 pm and were met by John G. and Rick with the van and checked into a local mom-and-pop style motel for the night. We arrived in Godbout on time at 1020 and drove the 65 or so miles east to Port Cartier (car-tee-ay, NOT car-shee-ay) in time for lunch and our 1 p.m. pre-arranged tour of the Cartier Railway shops. 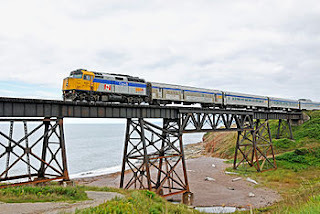 The Cartier is a 260 mile railroad that runs from the port to a captive iron ore mine. No trains were nearby in action, alas, but we were able to shoot Cartier's coaches (used on a weekly employees and supply train) and about a dozen of its Alco diesels, both 6-motor and RS18. A heads-up for Alco diesel fans -- the mine Cartier serves recently had its expected service life extended 20 years from 2002 to 2022. This changed the railroad's plans to stick with the Alcos for another 4 years, so they're scouting around in regard to replacement power. After the Cartier tour, we drove on over to Sept Iles (7 islands), another 25 miles or so. The Comfort Inn in Sept Iles was our home for three of the next four nights – not consecutive. For donut fans, there are 4 Tim Horton's locations in town. We photographed the inbound QNSL passenger train from Labrador City at the highway overpass east of town; it had two RDC's. 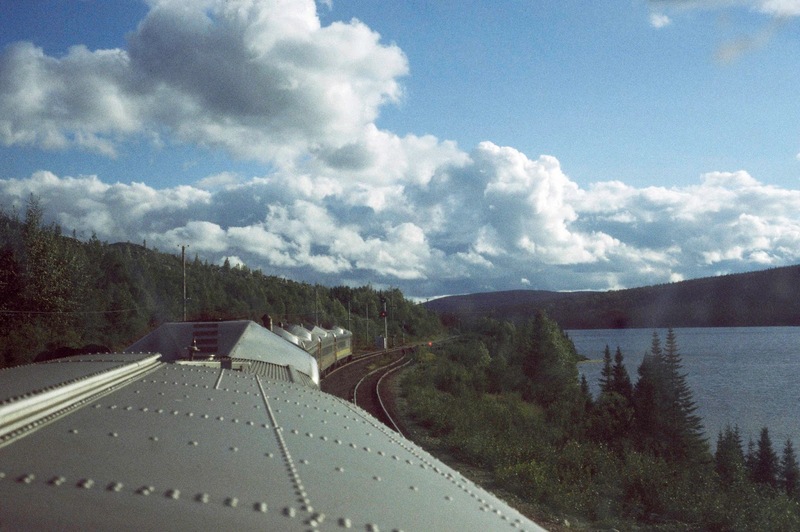 Summer schedules have two Lab City trains each week, and one to Schefferville. Other times it's one per week to each. The gang at the Cartier Railway shops. From left to right: John G., Dave, Rick, Chuck, John A. The Arnaud tour was next, pretty basic around the shop (1 unit inside) plus a look in the yard where the other 4 units sat on a train. Arnaud ore trains use the Wabush Lake RR from their mine north of Labrador City down to QNSL track, and QNSL units and crews handle their trains to Arnaud Jct., a few miles north of Sept Iles, where Arnaud's own crews go get the trains. Wabush Lake/Arnaud keep four or five Alco RS18's on each end, painted the same yellow and black but lettered differently. 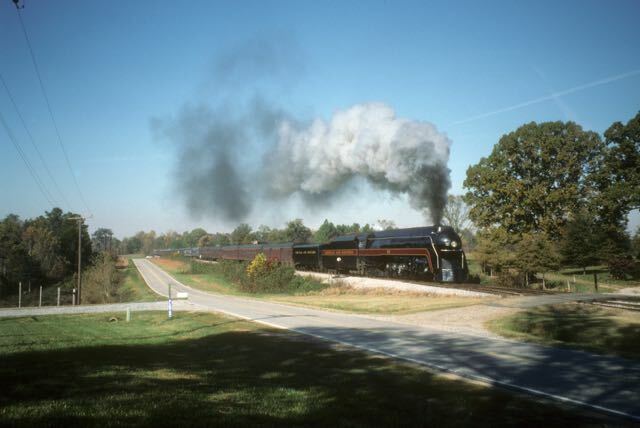 This railroad is publicly accessible at several places, but our timing was not coincident with road action, and John G. had arranged the visit. Wednesday afternoon was free, so both Johns and I took advantage of the lull to take a chance and drive the 150 miles east to Havre St. Pierre, until recently the end of pavement on Quebec Highway 138. (Rick and Chuck rested in Sept Iles.) It's not a hard drive, but it's a long one. "HStP" is home to the Romaine River Railroad of Quebec Iron & Titanium, which when John G. had called, had outlined their operation for him but had said, sorry, company policy won't allow us to give you a tour on the property. 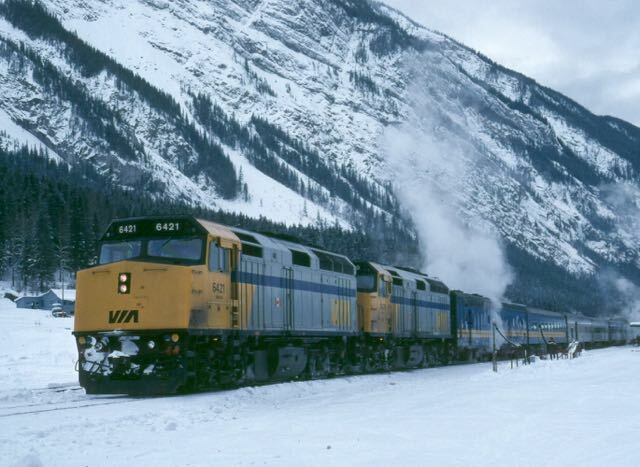 QIT runs a passenger train 3 times each day up the 23-mile line to the mine, which is not accessible by road. The railroad parallels Highway 138 the last mile or so into town, and therein lies access! 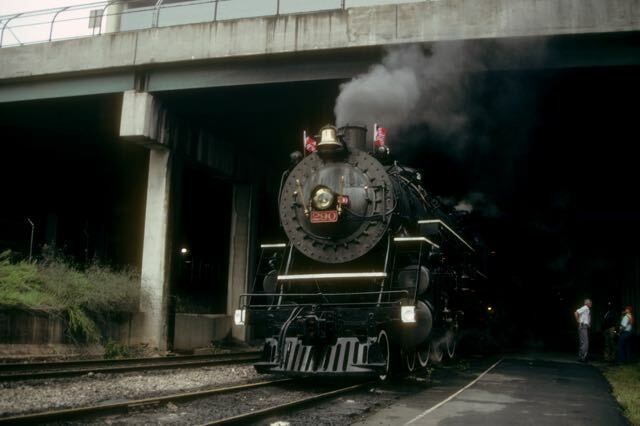 The first rain of the trip greeted us as we neared HStP, but John confirmed on the corporate office phone from the dispatcher that the passenger train, and an ore train (! ), were both due in within the hour. We went west and swatted mosquitoes and dodged raindrops while waiting. At 4:50 the passenger train showed up, an MP15 in dark red with an orange stripe, towing 3 ex-GO Ontario "Tempo" style cars and a boxcar-power car. We got two shots, one at the converging point and one at the grade crossing by the shop. The sun even sort of popped out. Twenty minutes later came the freight, two similarly painted GP9's pointed forward on 40 true ore jennies, some new, some old. He stopped in the yard, allowing multiple photos and angles. Again the sun popped out, and there truly was also a rainbow! QIT also has an S4 on display by their office, and it's shootable. Supposedly QIT allows groups to ride the train during certain months, mostly local schoolchildren. Needless to say, John G. is investigating. 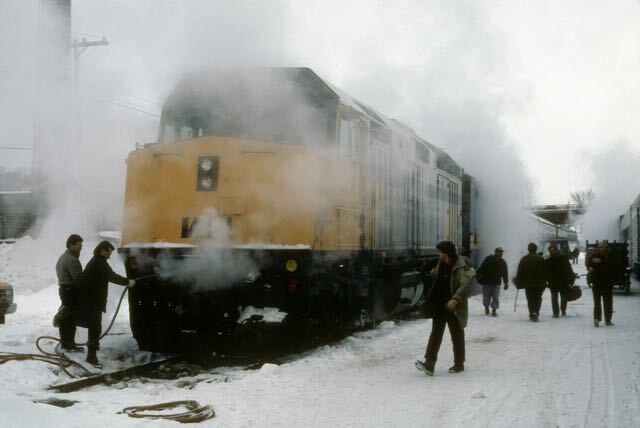 Dave Ingles wrote about this particular afternoon in the February 2009 issue of Trains Magazine, which supplied the following photo. 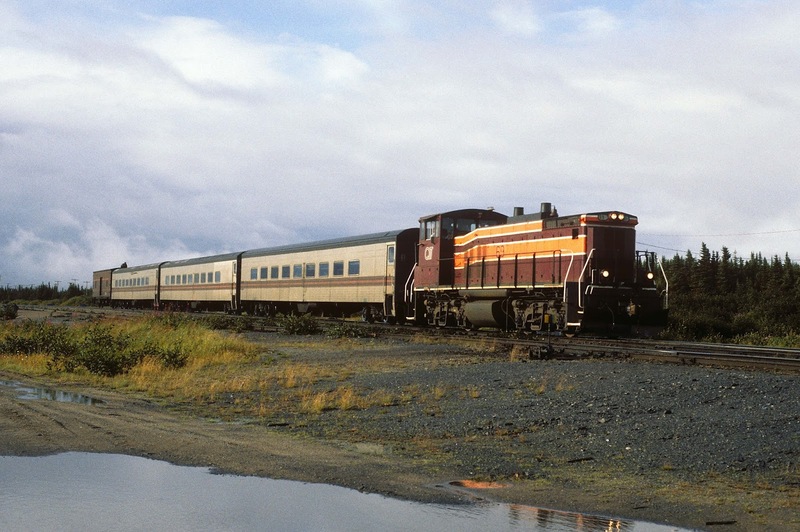 QNSL's weekly passenger train to Schefferville goes north on Thursday and back on Friday. There hasn't been mining at "S'ville" for a decade and a half, so this train and a weekly freight are all the traffic QNSL has north of Ross Bay Jct. (where the line to Lab City diverges), and it has turned off the CTC and decommissioned some sidings on its northern half. The service isn't endangered--social necessity--but S'ville ain't much, down from 5000 people in the mining heyday to 700 (in 2015 it is down to 250.) It's very French-speaking. John G. procured us reservations at the Royal Hotel, which has a restaurant, bar, and convenience store therein. The hotel isn’t much and at least one of our group reported what appeared to be bullet holes in the wall of his room. There are a couple of taxis in town; connect with the QNSL train crew and they're glad to help. In fact, we joined some of the crew on our return to the train the next morning. The train is normally 5 RDC's, all self-powered. Vending machines provide sustenance (pop $1, sandwiches $3), but it helps to bring your own snacks etc. to augment those basics. In addition to the train crew, QNSL assigns three security guards to each train to avoid "cultural problems" (my words). Although we made sure we sat in the same car where the guards made their "office," we saw no signs of any problems, and the guards admitted to being bored most of the time. A shuttle train operates from Ross Bay Jct. to Labrador City. On our northward trip, we also had the QNSL's dome coach 13510 on the rear, with a tour group. This is a singular car, having been Wabash-owned but painted yellow for UP's City of St. Louis, later N&W and then sold to Southern, which painted it Pullman green and used it on the Asheville Special. It's in fairly good shape, and the dome glass is reasonably clear. Going north we left Sept Iles at 924 am, nominally 24 minutes late but "schedule" is relative up here; sat at Nicman for 1 hour 9 minutes for trackwork ahead; passed the weekly Schefferville freight at Oreway at 348; set off the dome at Ross Bay Jct. 432-507 pm; and pulled into S'ville at 834 pm, which the crew considered a decent day's run. En route before the junction, we passed 1 ore train and met 5 ore trains. At Ross Bay Jct., the crew was talked into letting us off for some quick photos. The shuttle train had an SD40-2 and the 6th Budd RDC; the diesel was because of the dome coach, we concluded. Sy Reich and friends, who drove up here in July and provided us some valuable advance info, found this shuttle to be an ex-Southern coach behind an SD40-2. For the day, we unloaded passengers at perhaps a half dozen stops. The whole operation (except with RDC's and encountering more ore trains), and the progression of geography, too, are reminiscent of the Algoma Central. 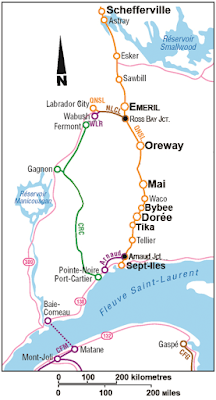 While Schefferville is in Quebec, the railroad dips into Newfoundland and Labrador before it reaches it. For at least some of us this has been our only "visit" to Newfoundland and Labrador. From our booth in the hotel restaurant at breakfast about 730, we watched the weekly QNSL freight come in to Schefferville across the water. After checking out, we taxied to the depot, made some photos in the rain of the SD40-2's switching around the depot, and boarded the train for departure, which came at 904, nominally 4 minutes late. 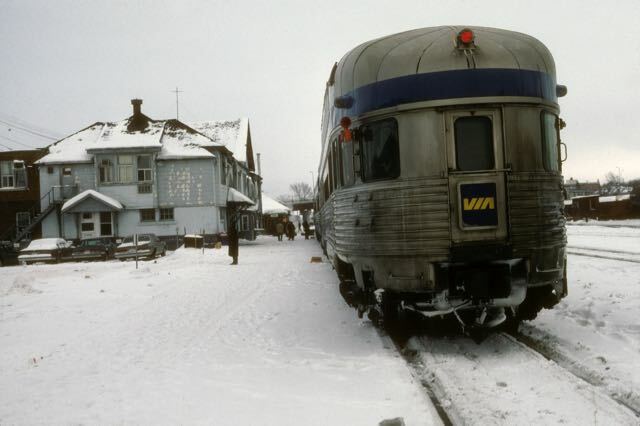 At Ross Bay Jct., we exchanged RDC's with the shuttle and added the dome car. John A. and Rick took the shuttle to Lab City to ride the 36-mile branch. At Lab City (which is English-speaking), they rented a car, did some shooting, stayed overnight, and flew down in the early morning to Sept-Iles on a commuter prop for $240 U.S.
With no tour group on the dome car, it was open to anyone, and perhaps a dozen of us enjoyed the dome most or all of the way down to Sept-Iles during changing sunny and cloudy weather. We met five ore trains, and arrived in Sept-Iles at 850 pm. Some runs have arrived after midnight, the guards said. This was the day of the long, 375-mile drive to just outside Quebec City, at St. Anne-de-Beaupre, where we arrived about 5 pm. We broke up the trip with occasional photos, and made Baie Comeau the lunch stop, after photographing the isolated railroad there. As we pulled into town we could see the rail carferry heading across the river back toward Matane, and at the slip yard we photographed chop-nosed Geep No. 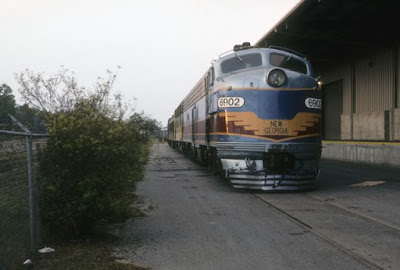 6055 (ex-EL 1217), painted blue and lettered for Donohue Corp., owner of the paper mill in the city. There are a couple of other customers, too. We also managed telephoto over-the-fence shots of the other two units, a switcher (ex-PRR 8537, an SW9M according to the "Canadian Trackside Guide," the Canadian railfan "bible") and ex-Roberval & Saguenay RS3 22, also both painted blue. The trip along this north shore includes a mandatory ferry ride across the Saguenay River near its mouth. Our vessel was the MV Jos. Deschenes. 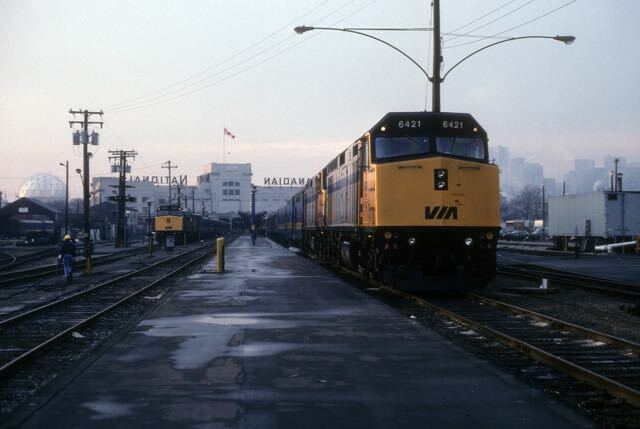 At Clermont we photographed the Quebec Railway's three ex-CN SW1200's parked by the office. This is the former CN line up along the river from Quebec City. Some quick tourist time began the day in Quebec City, including a stop at the CN yard (one Geep), a round trip on the ferry over to Levis and back; and a shot of the big Quebec bridge. The highway to Montreal is an expressway, and we broke the ride up only at Trois Rivieres for lunch and a quick look at the Quebec Gatineau's facility; that's the new regional on CP in these parts, and they have a bunch of un-repainted CP Alco RS18's and C424's, and some SW1500's in Genesee & Wyoming family orange. We arrived in Montreal in mid-afternoon, dropped John Godfrey at home and Rick at the airport, checked into our motel by Dorval Airport, and went to dinner. Chuck’s flight was early Monday morning, but John A. and I had some time and did some train watching at Dorval depot, sightings which included the Home Hardware-painted yellow VIA F40 (a promotion), and one of three VIA F40's leased by the Montreal commuter authority for the CP-route trains (the F units are beginning to fail). Thus endeth the Quebec saga. The February 2012 issue of Trains Magazine had an update on the QNSL authored by Andy Cummings and our friend and guide John Godfrey. 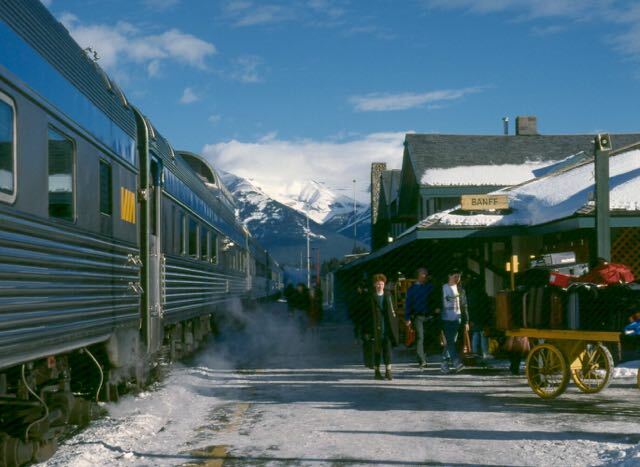 They report that seven years after the trip described above, the passenger train, now called the Expresse was operated by a consortium of First Nations tribes. As of the writing of this article the consist of the train had changed dramatically and was now a pair of F40s (the power on our Chaleur in 1998), a power car, baggage cars and coaches, all acquired from Amtrak. 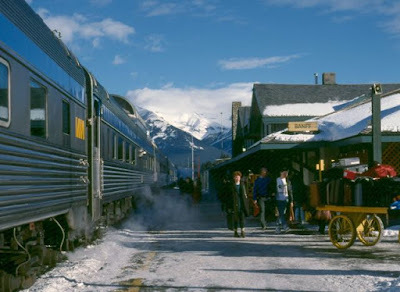 The passengers are mostly First Nations as well, and the train remains a lifeline to the wilderness dwellers who use it.